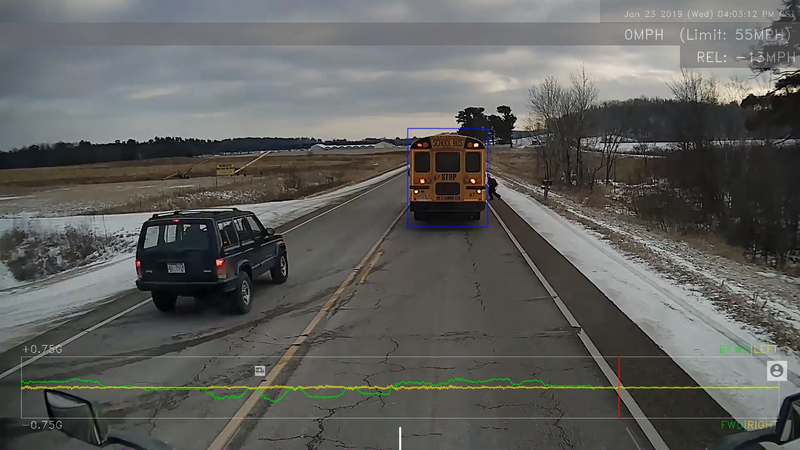 Through the eyes of a large truck’s dashcam, watch as the school bus ahead goes through two stops to drop off students. The first one goes smoothly, but the next one nearly ends in disaster as a Jeep Cherokee (XJ) flies by both the truck and the school bus, which has its stop arm extended and red flashers activated. A child can be seen briefly (extending the length of the stop by about five seconds) retrieving mail from the nearby mailbox before crossing in front of the bus as the Jeep hits its brakes at the very last second. According to the Dunn County Sheriff’s Office Facebook post, “the operator was located and cited.” The post also notes that this was not only a passing school bus violation, but a matter of dangerous passing as well, regardless of the bus’s presence. Watch as the Jeep’s brake lights come on when the driver realizes that it’s a school bus, yet is still carrying too much speed to react adequately to the situation. Luckily, no one was harmed. I think we can all agree that there’s a good chance the Jeep driver had no intention of passing a stopped bus and didn’t even notice it until having nearly cleared the truck. But bus or no bus, this was still a dangerous maneuver on account of the speed differential. This might also be a good time to discuss the use of hazard lights. Some say that in cases like this, the truck should have turned theirs on to help communicate the hazard ahead. I, for one, disagree with this idea because while it might have persuaded the Jeep driver to slow down, it could also have implied that the truck itself IS the hazard, stopping and inviting others to pass, instead of looking like the last in line of a normal traffic backup. What are your thoughts?